The Toronto Maple Leafs is a professional hockey team. 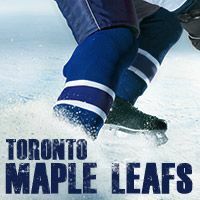 The Maple Leafs are part of the North-East division of the National Hockey League (NHL). This team is home at the Air Canada Centre in Toronto and holds 18 819 spectators. The Maple Leafs are one of the first six teams of the NHL commonly named "The Original Six". This team has won 14 Stanley Cups since its creation in 1917.